A custom designed system, by The Stereo Shop is a system that fits your life style, fits in with your decor and is easy to use. The Stereo Shop offers professional installation and custom Programming to ensure ease of use. Music is one of life's simple pleasures. It brightens the home, and provides relaxation for the tired soul. But gone are the days of bulky speakers hanging on walls, and sound systems refusing to integrate with home decor. in every room of the house! In this modern age of stereo, in which The Stereo Shop continues to innovate and provide the highest quality of service available, our custom home installation stands as a testament to music's ability to enhance everyday life. But custom home installation is more than cutting holes in walls for speakers. It's planning an easy-to-use custom system to fit your unique, personal needs, as well as your lifestyle and the decor of your home. Too many times we here at The Stereo Shop have come across home installations that lack expertise in set up, as well as system design. Component quality, optimal placement, and the ability to incorporate new technologies as they develop, these are things not always taken into account when building such systems, but are all part of the time-tested Stereo Shop formula for install designs. Since 1960, we have used the same care and attention to detail during installations as when we design high-end two-speaker stereo systems. The equipment we employ for home installations alone sets us as a leader in this field. Years of experience with the highest quality components, from Bowers and Wilkins speakers, to McIntosh electronics, has instilled an understanding of not only which manufacturers provide the best product, but which of these products synergize for the best possible result. Our custom design specialists will meet with you, your interior designer, your architect, and determine what equipment is best suited to your needs, as well as what placement of this equipment will give you the most out of your home installation. 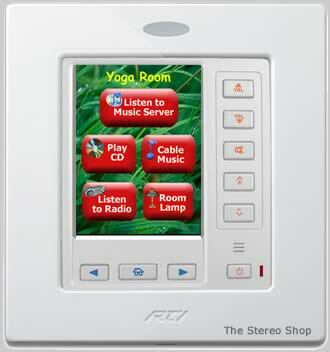 Whether for a single room, or a fully automated household system, using our custom designed remote or in-wall keypad, you can be sure that you will forget how you lived without such a beautiful sounding system. Never again will you receive a call at the office from a confused family member attempting to watch television. Using The Stereo Shop's custom touch screens and easy-to-use remote technology, which is outfitted to each home installation specifically, with one push of a button your sound system, television, and cable box will synch to the correct input immediately. Making movie nights into outings to the theater, and televised sports into unforgettable events in your living room, every household furnished by The Stereo Shop is soon to realize that they have brought a new kind of media entertainment home. For more information please be sure to visit our B&W custom in-wall speakers page, as well as our RTi Smart Remote and Touchscreens page. 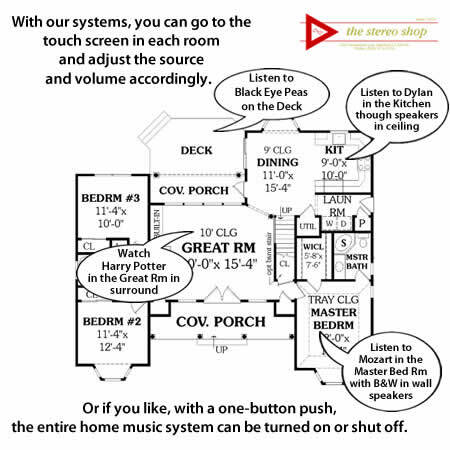 Bring your house plans into us at The Stereo Shop, and meet with one of our audio-video architects.